After two hugely successful conferences, IBBC is delighted to announce that it will once again hold its Autumn Conference in Dubai, UAE on 25 November 2018. 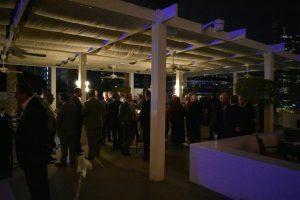 With Dubai being a hub for local and international companies in the region operating in Iraq, the conference attracts suppliers, investors, producers and buyers from Iraq, the UK and the wider international business community. 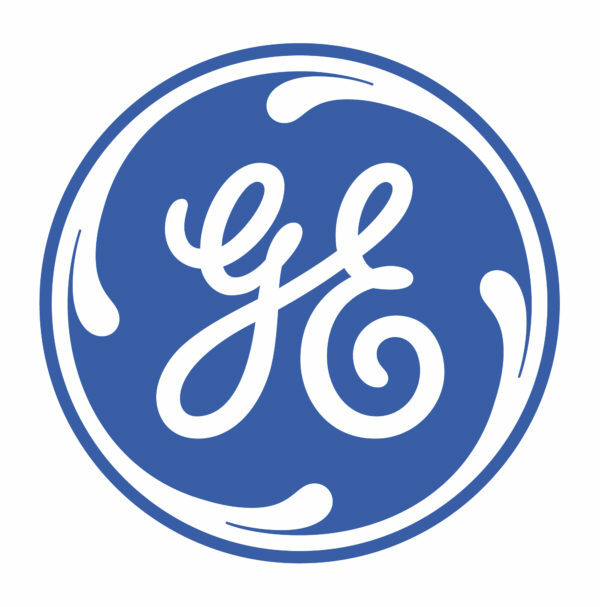 It also facilitates discussions with influential decision makers across all major market sectors. As well as providing many networking opportunities. This year’s Agenda will focus on the key issues of how Iraq can rebuild its towns and cities and develop its economy and evolving Infrastructure and utilities with an emphasis on water, expanding Oil & Gas production, improving the Regulatory Framework and financial systems and exploring the role of logistics in moving people and materials into and around the country. The Conference will also feature the highly successful Roundtable Discussions in the second part of the day, where delegates can engage in dynamic and concentrated debates with high-level governmental figures on the country specific issues that matter most. Baroness Nicholson of Winterbourne, The Prime Minister’s Trade Envoy to Iraq, Azerbaijan, Turkmenistan & Kazakhstan and President of the Iraq Britain Business Council. H.E. 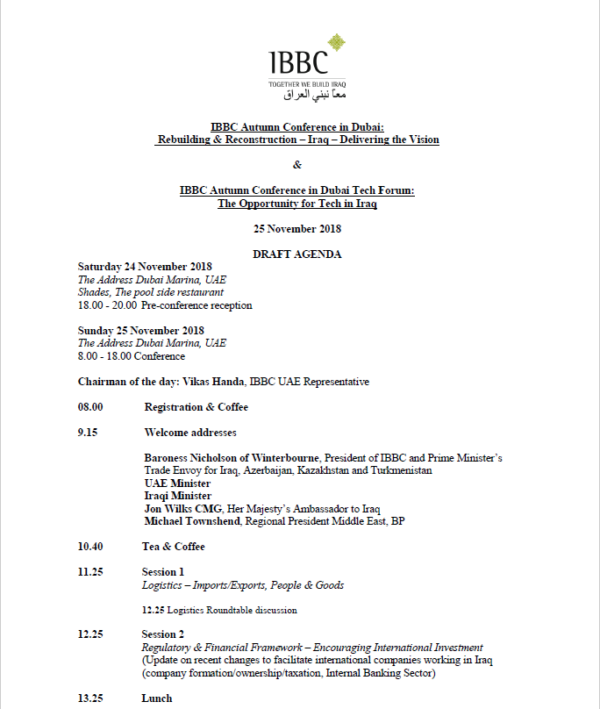 Abdulla Ahmed Al Saleh, Undersecretary of the UAE Ministry of Economy for Foreign Trade & Industry has confirmed his participation to give an opening address at the conference and the IBBC is delighted that His Excellency will once again lend his considerable support to IBBC and its member’s efforts to rebuild Iraq. H.E. Bengan Rikani, Iraqi Minister for Housing, Reconstruction & Public Municipalities, Government of the Republic of Iraq. Michael Townshend, Regional President BP Middle East is confirmed to speak on the Oil & Gas session. Michael has been working for BP for 33 years and was President of BP Russia in 2013. Starting October 2014, Michael became The Regional President BP Middle East. Jon Wilks CMG, Her Majesty’s Ambassador to Iraq, who has been Ambassador to Iraq since November 2017. Ambassador Wilks has held numerous roles in the Middle East in a long and distinguished career spanning 30 years at the Foreign & Commonwealth Office. IBBC will also be holding a Tech Forum on 25 November, which will run in parallel to the conference at the same venue. Ticket holders will get complimentary access to the forum, where some of the key innovators of Tech in Iraq will be speaking on Fintech, the Consumer Economy, E-Government and the Start-Up Economy. Speakers include reps from EY, ZainCash, Citi Bank, Restrata Group, MediaWorld, Khudairi Group and the Technology Department of the Kurdistan Regional Government. 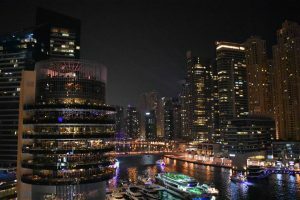 A pre-conference reception and networking event is planned for Saturday 24 November at the Address Dubai Marina, where delegates could enjoy the spectacular surroundings and view.